Whether its a Patio Table, Hanging from Trees or a Special Garden Area where You Relax with Friends, Lantern Light adds a real atmosphere, warmth and style. We have Many Different styles and colours of Lantern, some with a classic style, others with a modern retro twist. You can place Lanterns in Trees & Fences and have Hanging Lanterns around a secluded area for that extra special mood. The intricate designs ensure that these lanterns are as impressive in the day as they are at night time. 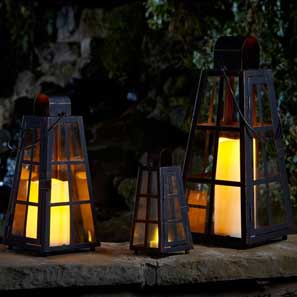 Our Lantern Lights Powered by Solar Energy have very Efficient LED lights that provide you with a cost-effective, practical, Safe, Gorgeous AND environmentally friendly way to use lighting in any Indoor or outdoor garden space.